Some accuse North Korea of paranoia, but its reputation as a hell-raiser gives it a fighting chance now that interventions in rogue countries have become routine. The world is once again looking toward the Korean Peninsula with apprehension, though at this point it should be used to Pyongyang’s routine threats to wipe its enemies off the map. This time North Korea appears resolved to show its foreign partners that it is ready to take drastic measures. The suggestion that foreign states evacuate their embassies because Pyongyang will not guarantee their safety after April 10 is unprecedented in peacetime. It was announced last Thursday that North Korea had moved a medium-range missile, known as a Musudan or Nodong B, to its eastern coast. Western experts said it was unclear if the missile was moved as a menacing gesture or in preparation for a test launch. Unlike Iran, which has huge ambitions and a specific view of the geopolitical architecture in the region, North Korea has just one vital goal – to prevent anyone from encroaching on its interests. Some accuse Pyongyang of paranoia, but its reputation as a hell-raiser gives it a fighting chance now that interventions in rogue countries have become routine. The North Korean leadership is doing its utmost to show that it would go to any length if threatened. Knowing what happened to Saddam Hussein and Muammar Gaddafi, whose fates are proof that bluffing is not a wise policy, North Korea has created a nuclear and a missile programme. It may have few nuclear missiles, but their very presence makes the price of potential foreign interference unacceptably high. This does not mean that there's no risk of a confrontation spinning out of control. The tactic of trying to scare others with one’s irrationality can only be effective if the scale and intensity of the threat keep growing. But an irrational country may eventually be forced to do what it has been threatening to do in order to save face. The logic of such confrontation is extremely dangerous. It appears that this time, Pyongyang has decided to go all the way, demonstrating its inflexibility and readiness to begin the final countdown, which explains the warning to the embassies. It should be noted that Pyongyang usually takes reactive rather than proactive steps. This time its bellicose response was provoked by US-South Korean military drills, which Pyongyang denounced as a “rehearsal for invasion.” On the other hand, everyone seems to be angry with North Korea, including its main patron and sponsor, China, which cannot hide its irritation at the Kim dynasty’s actions. It is worried that these actions give the United States a legitimate reason to build up its military presence in the region. Washington, which began rebalancing its policies toward Asia (actually, in order to resist China’s growing power) a year and a half ago, needs no better reason that an irresponsible regime threatening its neighbours. The problem is that no one knows how to influence Pyongyang. Sanctions are ineffective in ensuring policy change in a country that embraces sanctions and cultivates self-isolation and autarchy. When the United States began its joint naval exercises with Seoul, Pyongyang shut the border to the Kaesong Industrial Park for workers and managers from South Korea. Kaesong is a major source of foreign currency for North Korea, so threats to stop cooperation if tensions escalate should have come from Seoul. 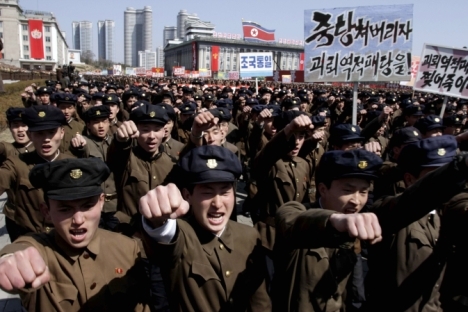 But it is Pyongyang that is demonstrating willingness to make sacrifices. Russia’s stance on the Korean issue has not changed for a long time. The Kremlin does not believe in the effectiveness of pressuring Pyongyang and has called for the gradual socialisation and international integration of North Korea. Moscow apparently knows that this will be an uphill battle because of North Korea’s siege mentality. Pyongyang does not trust anyone, especially after the failed attempt to make a deal with the United States in the 1990s. Moreover, the Workers’ Party of Korea has drawn its own conclusions from the collapse of the Communist regimes in Eastern Europe and the Soviet Union. It decided that liberalisation is not a good path and that it must go down fighting. This is not an absurd conclusion at all, because Soviet-type states are incapable of soft reforms and tend to degenerate as soon as pressure is withdrawn. Several years ago, Moscow proposed a new paradigm for the Korean Peninsula: building a trans-Korean gas pipeline that would bring Russian gas to the South Korean and Pacific markets. It would bring gas to North Korea and also make it a transit country, with all the ensuing benefits. Given the current tensions between the two Korean states, the project appears to be utopian, but then all other methods of resolving the Korean nuclear missile problem proposed by the United States in the past 15 years have also failed, or rather, have fanned tensions instead of alleviating them. One can wait for the North Korean regime to collapse, which is bound to happen eventually, with dramatic consequences for its neighbours, or try to tame Pyongyang. If the latter option is chosen, Russia will have an advantage over other countries. First, Pyongyang does not fear it, and second, Russia’s stance in the region is neutral compared to that of other countries. Tensions that are escalating around North Korea represent a serious problem, but this situation will not last forever. The Korean Peninsula is one of the few remaining Cold War relics, and the two Korean states will eventually reunite. However, much will depend on the method of reunification, which will lead to a redistribution of forces in East Asia, because a united Korea will act differently than its independent parts. Koreans have accumulated a huge pile of complaints against their neighbours over the last disastrous century. The appearance of a new major power in the region, on which global attention is focused even now, will greatly influence relations between the United States, China, Japan and Russia. When reacting to the turmoil in Pyongyang, it's worth keeping in mind a longer-term perspective.